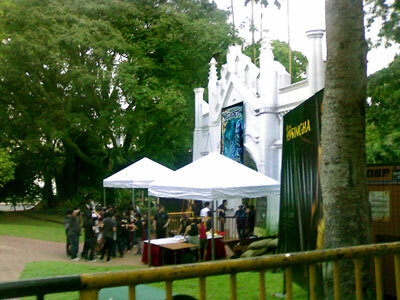 26th October 2007 was when I saw Dave Mustaine in flesh in Fort Canning Park, Singapore. Yes, the original guitarist for Metallica, since sacked for drug and alcohol problems, who then formed his own thrash metal band, Megadeth! A few albums later, he discovered neo-classical shredder Marty Friedman, and they made the sweetest, crunchiest, progressive blend of thrash and speed metal. 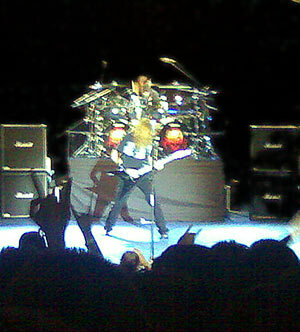 Those times did not last, but Megadeth is still playing thrash metal and keeping it true. I can’t say the same for Metallica. A slow guitar intro started the set, with the familiar chugs of Sleepwalker coming in. This was what I thought was the most intense of the songs from the new album, United Abominations, and they picked a good starting song! The crowd shifted about with human bodies moving like ocean waves. I always wondered if they’d play their older stuff, or keep strictly to the new album, since it was a United Abominations Tour Of Duty anyway. Thankfully, Take No Prisoners came on! Once the main riff hit at 0:36 (well, on the album, anyway), we all jumped, dancing in circles with elbows out. Undoubtedly, the crowd energy was more intense with the stronger hits. We all chanted along, “Don’t ask what you can do for your country! Asssk! What your country! Can dooo! 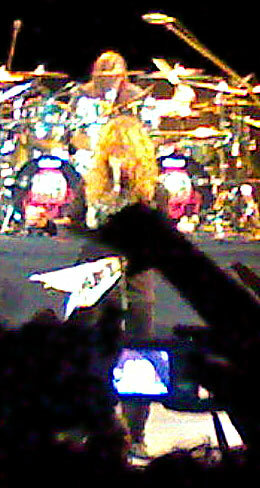 For you!” This song was off Rust In Peace, their first album with Marty, of many to come of my favorite Megadeth lineup. Wake Up Dead was next, from an older, more plainly thrash metal album – Peace Sells… But Who’s Buying. They fast-forwarded to Skin O’ My Teeth from Countdown To Extinction, followed by a speech. What’s next? Washington Is Next! From this point on it could be made clear that Megadeth was playing a healthy mix of the old and new, evenly spaced out! Then, there was one of their slowest songs, A Tout Le Monde (which is the only song from Youthanasia.) The brooding In My Darkest Hour, from So Far, So Good… So What! then came on. The ascending chromatic chord progression that would also be heard in Metallica – The Call Of The Ktulu were heard in chord form. Hangar 18! Eight or more solos of bliss! Alternating between the bluesy licks of Dave and the melodic neoclassical of Marty, while mucking around with rhythm changes, the whole lot of us were singing the solos aloud. We were not alone! Interestingly, Megadeth performed the songs exactly as you’d hear them on the album, 32nd note by note. Dave’s voice followed the original recordings, not the voice on the remastered album. I found that amazing because you’d feel like you were teleported into that era when the album was produced! James Hetfield however, uses his newer voice on older songs. Of course, James sounded worse in Metallica’s first album, heh. I don’t know why Megadeth played note-by-note though; after all, guitarist Glen Drover was from King Diamond and you’d expect some amazing degree of technical prowess from Dave and him. Then again, it might be the case of the classical piano player who can’t make up a solo jam to save his life. 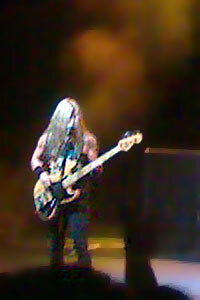 James Lorenzo on bass was from White Lion. Who’s the drummer? Shawn Drover is Glen’s brother. Next up: Gears Of War, from their United Abominations album, and She-Wolf from Cryptic Writings. Apparently, this was a Singapore exclusive. Then, there was The System Has Failed from the album of the same name. I am positive, however, that crowd participation was greater with songs from the Rust In Peace album, as Tornado Of Souls showed. Ashes In Your Mouth, from Countdown To Extinction, and Never Walk Alone… A Call To Arms returns to the new. They took a break, and returned when an orchestra could be heard. Jeng-jeng JENG! Or however it was pronounced, we all mouthed the riff to Symphony Of Destruction (off CTE)! They played the extended version. This began a flurry of crowd favorites, like Trust (off CW) and Peace Sells… But Who’s Buying? (off an album the same name). Thank you and goodnight, they said, but we all knew what to do. Call for an encore! “Holy Wars!“, chanted the crowd. They returned obligingly, with one of their most technical, progressive metal songs. “Brother will kill brother, spreading blood across the laaand, killing for religion, something I don’t understand“, we sang along. For once, they mucked with the song, and slowed down the classical riff before the second half of the song. Except, of course, that they played Mechanix instead, which can be heard as a slower Metallica – The Four Horsemen elsewhere. Oddly, I liked Metallica’s Kill ‘Em All album because a lot of it was contributed by Dave. Again, this was a Singapore exclusive! Thank the devil then, for they returned to the second half of Holy Wars, The Punishment Due. I was finally satisfied. Oh, and I won’t be uploading videos due to my inability to hold the phone completely still, or shut up during the riffs or sing the wrong lyrics. So here are some videos from Mark/Halcyon, a Korean guitarist who plays excellent covers! This entry was posted in Music, Pictures on November 14, 2007 by 2konbla. did james lorenzo bring his explorer shaped warwick? Meaning that Kirk Hammet is after Dave Mustaine? Hehe..sorry…not too good with band history. aldo: Looking at some of the videos, I doubt he changed basses; it looks like he stuck to a plain Fender instead of any of his funky basses. pat: Yes, Kirk came after. There is a difference in sound and composition between Kill ‘Em All and Ride The Lightning (which Dave co-wrote) and everything else after that. Some later songs are allegedly Dave’s, too… the more evil, rhythmically complex, progressive-sounding ones, I suspect. sounds like u had a good time. sure beats only watching dave walk past. haha. But… but… you were closer to him than I was! Yuen-Chi Lian: Having not heard Arch Enemy, I think you should hear the unholy combination that Dave Mustaine and Marty Friedman first made with the Rust In Peace album. Not really into Megadeth, recently, having a lot of Arch Enemy here though.